Health Costs > How Much Does Broken Arm Treatment Cost? How Much Does Broken Arm Treatment Cost? A broken arm can actually refer to the fracture or break of one of the many bones from your wrist to your shoulder. Although each bone may require a different type of cast for a different period of time, the overall costs will be fairly close. Like any other medical procedure, the costs associated with treating a broken arm depend largely on the severity of the problem. If it is just a simple fracture, then a simple treatment will do the trick; however, if the fracture proves to be very serious, a cast may not be enough. Most surgeries in the United States for a broken arm will range anywhere from as little as $250 to as much as $5,800 without any sort of insurance. The treatment and repair of complex fractures can be upwards of $20,000 or more. Without insurance, TheLawDictionary.org states that the total costs will be around $2,500 and $3,500; this is the price if the injury is just a simple fracture and only needs a cast. However, if it is a complex fracture or full break that involves broken skin and nerve or muscle damage, expect to pay a lot more. Aside from the doctor’s fee, the doubled costs for this would be attributed to the tests, treatments and even therapy that may be done to address your broken arm. Dineane on HubPages talked about the costs she had paid for her broken arm. According to her recap, she had spent close to $27,000, not including the pain medication. This fee included her emergency room visit at a local hospital and the cast application. An x-ray, for example, costs between $150 and $220. A CT scan may also be required to further diagnose the concern. This costs around $500 to $1,000. Also, a splint, cast or other setting is necessary. This will also affect the overall costs. Depending on the size and type of setting that you receive, this will cost you between $200 and $400. For a surgical treatment, a fracture would include $90 to $200 for the initial or emergency room visit and around $250 to $950 for the exact treatment. This is according to c-osa.com. With health insurance, the costs of the treatment are significantly reduced. You can check with the Insurance Commission if you are billed correctly by physicians and medical providers you are using. If you want to change your health insurance policy or look for a new one, eHealthInsurance.com can help. A “reduction” will be done by the attending physician for patients who have simple breaks only. After undergoing an x-ray that confirms the broken arm, the doctor positions the broken bones if there is a need. A cast will be placed on the arm to allow it to heal properly. For breaks that are complicated enough, the attending doctor would make an incision and implant wires, screws or other hardware to hold the bones in place during healing. This may be a complicated process, but will truly address the issue. As for the healing or recovery process, the time will largely depend on the extent of the damage. Like any other medical procedure, a doctor’s visit (or several doctor visits) will really take a toll on your budget. Specifically, each of these will cost between $150 and $300. Not to mention that the cost may rise significantly if your first visit brings you directly to the emergency room. Emergency room visits will cost more than visiting the doctor’s office. If your broken arm needs more than just a cast for recovery due to its severe damage, you may need to undergo physical therapy. If your doctor requires this, your costs will undoubtedly rise further. Basically, treatments not related to the original fracture or surgery will have a separate fee. The average physical therapy session fee without insurance can cost close to $150 to $200 each. For serious fractures, the cast may need to be changed every couple weeks. This, of course, will add to the expenses. The same thing goes for slings, splints and braces. Sometimes additional x-rays are required to further diagnose the concern and to check the development of the treatment. As we all know, each x-ray scan will be charged. However, if you bring your previous x-rays to another facility, the physician will have them reviewed and no charges will be made. It is known that most hospitals bill separately for supply charges such as braces, slings, ace bandages, suture trays and other items. 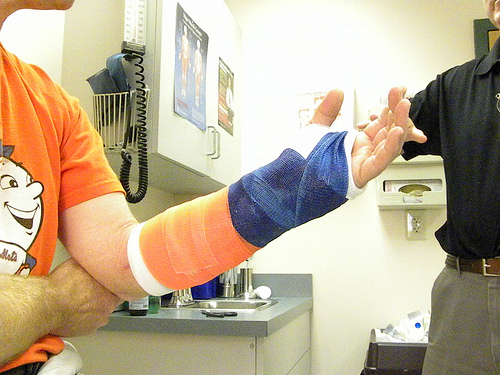 Usually, the charges for cast changes due to the patient request are not covered by your insurance. If you went to an emergency room, then you should add at least $1,000 to $2,500 to the total costs mentioned above. Statistics tell us that broken arms account for around half of all bone fractures in adults. Broken bones are considered medical emergencies and should be evaluated and treated by a medical professional as soon as possible. The number of days for follow up varies by the type of surgery or the severity of the fracture. However, most physicians would agree that it is normally 90 days. It is always wise to ask your healthcare provider about any payment plans on offer before agreeing to pay for any treatment. Will my insurance cover the expenses for the treatment of my broken arm? Do I need a separate therapy after the treatment? How many days will it take for my broken arm to be fully movable again? How long will I be wearing a cast? Can I get additional braces for free with my insurance backing me up? Or will that be billed separately? Always make sure that you are covered by your health insurance. Treatments of broken bones are no joke. Thus, full or partial coverage will truly help a lot. Consider a hospital that offers discounts. Many hospitals will offer cash discounts or even waive fees if you meet certain income requirements. If your budget does not allow you to go to private hospitals, you can opt for free clinics such as community hospitals. Some of these government-run hospitals offer free orthopedic specialty care.